Three public and private institutions each would be conferred with ‘institute of eminence’ status that would give them unprecedented administrative and academic autonomy, human resource development minister Prakash Javadekar has said. IIT Bombay, IIT Delhi, IISc Bangalore are the three government institutes. BITS Pilani and Manipal University too have bagged the eminence tag. Reliance’s Jio University is the only greenfield institute selected from the four private entities that applied for the status. 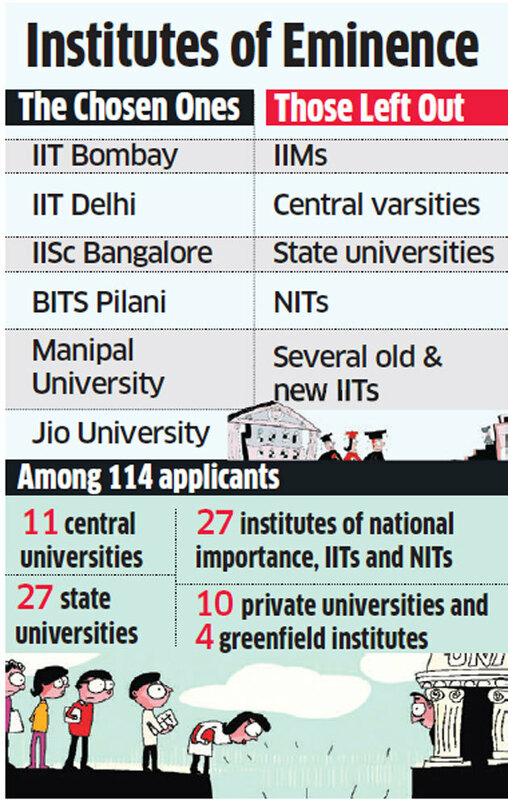 Not a single central or state university or IIM has made it to the coveted shortlist. Since it is yet to be established, Jio University will, however, be given only a letter of intent now, empowered expert committee chairman Gopalaswami told ET. “Jio University being greenfield will not get the status. It will only get a letter of intent. After three years, it will be assessed if it has achieved what it promised and only then will the status be accorded or withdrawn as the case may be. They were chosen as they were ready with a clear academic and administrative plan, funds and land possession. These are the things that will be looked at in greenfield category as there is no academic record to assess.” The HRD ministry defended the move citing clause 6 of regulations related to the scheme that provides for greenfield institutes to be conferred the status to “allow responsible private investment to come into building global class educational infrastructure, thereby benefiting the nation”. The ministry said the EEC received 11applications in greenfield category and only Jio University satisfied the four prescribed parameters on land availability, core team, strategic vision plan and additional funding. The HRD ministry added that the Indian Institute of Human Settlement, Bengaluru and the Indian Institute of Public Health, Gandhinagar, were recommended by EEC in the category for being given flexibility and they would be considered separately.